Size of this preview: 503 × 600 pixels. Other resolution: 864 × 1,030 pixels. 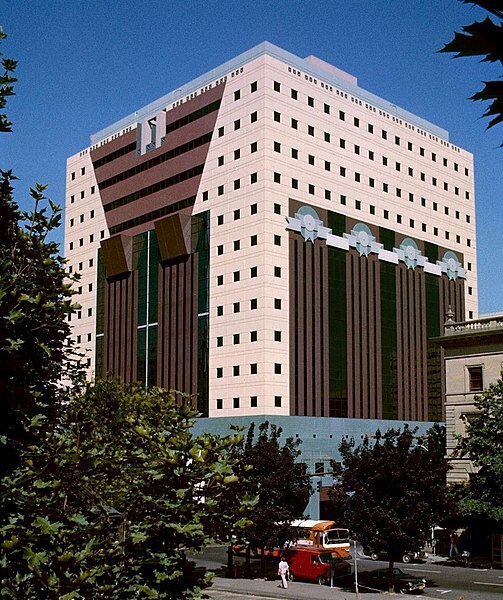 English: The Portland Building, in Portland, Oregon, in August 1982, about eight weeks before it opened. The building was designed by Michael Graves. This photo was taken from near the intersection of 6th & Jefferson, looking across a surface parking lot which soon after this was replaced by the PacWest Center, making this view of the Portland Building no longer possible. See below; user MUST attribute the photographer (Steve Morgan) on any reuse outside Wikipedia. The Portland Building in August 1982. Photo by Steve Morgan.